These books included my first Lewis Carroll and E. E. Cummings books, now part of a collection that I keep in entire six-foot-tall bookcases full of their work. Powell’s is still a spectacular bookstore. It used to be that I never set foot in it without spending at least a hundred dollars. However, on my most recent visit in August of 2016, I hardly bought anything (okay, two books—Simon Winchester’s The Alice Behind Wonderland and Michael Chabon’s novel Summerland, both in hardback). Before Amazon and the Internet, Powell’s always had treasures and discoveries, but those days seem to be gone, because now I can find most of Powell’s surprises online. Plus maybe I’d be more delighted to see particular books if I didn’t already have them. 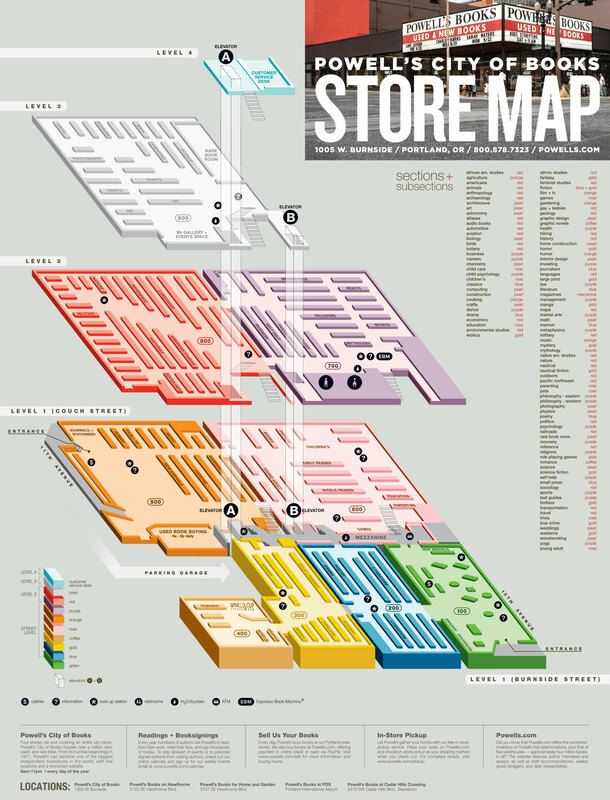 Still, if you ever have the chance, get yourself to Powell’s, pick up a store map when you enter, and give yourself a few hours to wander and wonder. You’ll be there for a while: If you rocket along, looking at one book per minute for eight hours a day, every day of the year, it would take you almost six years to look at every book—and then, after six years, you’d have to catch up with all the new books they’d add during that time. It is, after all, not only my favourite bookstore in the entire world, but also the largest.